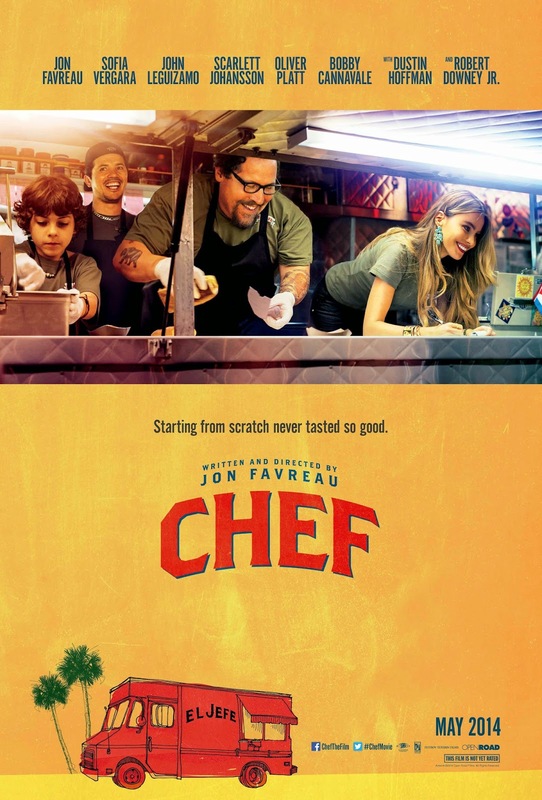 “Chef” is a film that I’ve been looking forward to a while, as it marks the return to independent filmmaking for actor/director Jon Favreau who starred in “Swingers” and stared and directed “Made” back in late nineties and early 2000’s. Both films were films that I liked back in the day and still do. Since then, his directorial career has taken off with films like “Iron Man” and “Cowboys and Aliens”. “Chef” is the latest and most ambitious film that he’s done to date. The film is a about a gifted chef (Favreau), who suddenly quits his job after a food critic (Oliver Platt) writes a very negative review about his cooking and dealing with a boss (Dustin Hoffman) that won’t let him change the restaurant’s menu to please this critic. Without a job, he needs to find a way to pick up his once promising career. He travels to Miami to team up with his ex-wife (Sofia Vi, best friend and son to launch a food truck. His would reignite his passion to cook and give him a new lease on life. The film also Going into “Chef”, I had a feeling that I was going to like this film a lot considering it looked like my type of film. This is a return to form for actor/director Jon Favreau after directing many studio films, this is most definitely is his best film since “Iron Man”. Most of that had to do with his directing here. One of the main things that makes it work so well, the way that he approaches his screenplay. Whether it’s the way that he directs some of the film best scenes to the way that he made the tone feel upbeat throughout, it made me very invested with was happening. When a film like this makes you want to smile, then you know it’s something that’s going to stick with you. The other thing that Favreau does very well is to make his performance and the performances around him very good. He does a very good making sure he and his cast had chemistry with each other. It made some of the film’s scenes very heartwarming and entertaining. This also helped made this film very enjoyable to watch, as it helped make characters very feel ordinary. The screenplay from Favreau was just as good as his direction. One of the things that makes his screenplay very good, the way that everything is developed. Favreau does a very good job not rushing things. He made sure to take his time and let the characters and story develop. In an age where most films are rushing scenes to get straight to the action, this film doesn’t. Instead, it builds and builds layers to the point that you’re interested in the main character’s journey to being a relevant chef again. The other thing that I liked about this screenplay was the way that Favreau’s screenplay also spends time focusing on the main character’s relationship with his son. The whole subplot works very well because of the way that he makes those scenes have emotion to them. It made me interested and invested in the whole father/son relationship. It also gives the film some of its heartwarming moments. The extras starts off with the director’s commentary track. Faverau and co-producer Roy Choi did a great in going into the various aspects of the film’s production. Whether it’s the preparation that Faverau did in anticipation of his role to the stories of the film’s production and screenplay, they both go into great detail about this film. It’s worth checking out after watching this film. After that, the extras wrap up with deleted scenes. This is truly one of the best films that I’ve seen all year and I hope it finds an audience on DVD and Blu-Ray. With its great direction and very good screenplay, “Chef” is one of the year’s most entertaining and heartwarming releases.